Rajasthan : The most colourful region in India. An exotic land of valiance and chivalry. A land endowed with invincible forts, magnificent palaces and havelis. Unending hilly ranges and waves of sand dunes serene lakes. The State represents an unusual diversity in all its forms-people, culture, customs, costumes, cuisine, dialects and music. 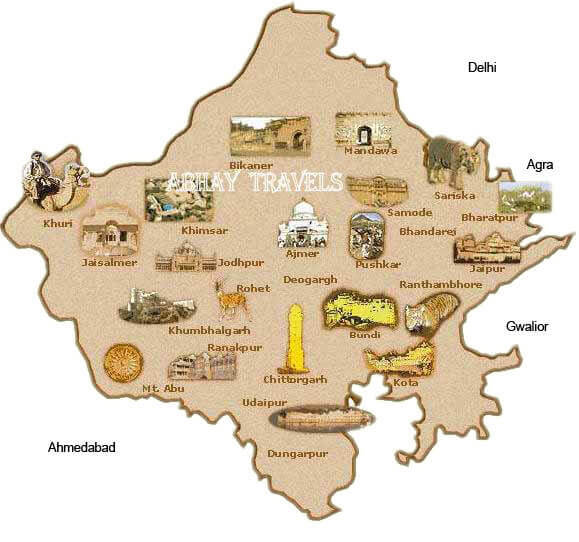 No other region in the country assembles the many paradoxes of India as does the desert land of Rajasthan. Unexpected forest glens, lakes and temples appear like mirages in the deserts. On the crag are seen rugged forts, testimony to a turbulent history. Innumerable temples dating back to the 7th century still survive amidst scattered ruins, medieval cities exist around turreted marble palaces and spacious gardens. Rajasthan, a land of princes, palaces and preening peacocks is renowned for its monuments, art and culture that go back to several centuries. Admire a range of miniature paintings and frescoes of exquisite refinement. There is romance in Rajasthan�s forts and palaces and arts of gallantry retold in ballads and legends. Then there are sanctuaries sheltering rich and varied species of flora and fauna. And the shimmering Thar desert belt charms with a rare and amazing sight. Rajasthanis are a handsome people with colourful costumes. They express themselves in colour and sound not easily seen or heard anywhere else in the country.